Who would replace Keegan? That was the question on all Liverpool fans lips during the summer of '77. Maybe no one. Maybe Bob would just switch things round a bit. Kenny Dalglish had scored a few goals for Celtic and also took the mickey out of England, Ray Clemence in particular, on more than one occasion. Seemed a bit overpriced though at a British club record fee of £440,000. With Bob's help Kenny was to become the greatest player ever to pull on a Liverpool shirt. Arguably also the greatest British player ever. A letter in the Echo from a lady, who was a Celtic supporter said, "Kenny's smile will light up Anfield when he scores." Was she right or what?! Never much of a smile from Kenny at any other time but when he, or indeed any other Liverpool player scored, that smile could light up the Mersey, never mind Anfield! Bob signed another young Jock from Partick Thistle. Apparently this lad was great at every sport. You name it, he'd represented Scotland at some level: Football, cricket, basketball, volleyball. He could even have been a professional golfer. One of those annoying people who was good at everything. He did though have a penchant for running naked on Blackpool beach! Name? Alan "Jocky" Hansen. "Jocky" played a number of games early in the season as replacement for the injured Emlyn Hughes and Phil Thompson. Bit gangly and wasn't a bad player but nothing special. Bob reluctantly waved Tosh off to Swansea, as the big Welshman's persistent injuries finally put paid to his Liverpool career. A depressing run of results in November (again) highlighted the need for a new central midfield player, as the ageing Cally wasn't quite doing it any more. A third round FA Cup defeat at Chelsea saw Bob take immediate action. Graeme Souness was signed from Middlesbrough. Unlike a lot of players Souness took no time at all to settle in to life at Anfield. He became an almost instant hero with a stunning volleyed goal against Manchester United at Anfield, which won the BBC Goal of the Season award. A big bear of a man with the touch of a violinist he could hit a ball like it had been fired from a cannon. He was as mad as Rasputin in the tackle, very rarely coming out without the ball, and sometimes the man! He could also caress a ball with all the gentleness of Casanova seducing a young lover. In short the complete player. Bob had done it again! With all hope of domestic glory gone it was off to Wembley to defend the European Cup. Ah well, you can't have everything. A freak injury had ruled out Tommy Smith so the young Scottish streaker was called up in his place. Not a trace of nerves from young Hansen. He looked the complete centre-half, as the Bruges forwards had no effect whatsoever. Further up the field the other two Scottish maestros were doing their bit. Souness played the sweetest of touches to Dalglish, which had "please score" written all over it. Kenny duly obliged by kidding Jensen, the Bruges goalie, that he was about to shoot. As Jensen dived Kenny lifted the ball ever so gently over him before disappearing over the advertising hoardings to celebrate in front of his adoring public. Bob, by bringing vital new players in, had masterminded his second European Cup success. No cup successes the following season but the League statistics told their own story: 68 points. 85 goals scored. Only 16 conceded. In spite of the dearth of cups many people believe this to be Liverpool's best ever team. After all, League performance is the yardstick by which any team should be judged. David Johnson had responded to several kicks up the backside from Bob, finishing the season with 16 league goals, second only to Kenny who was five in front of him. In defence the previously gawky Hansen had, by astute coaching, been turned into a top-class centre-half. His seemingly effortless command of the middle of defence belied a touch of steel reminiscent of another Scottish centre-half, "Rowdy" Yeats. Alongside him was the redoubtable, though coming to the end of his Liverpool days, Emlyn Hughes. Emlyn was Bob's captain and was everything on the pitch that Bob was off it. Bob though was grooming another captain to replace Crazy Horse in Phil Thompson. Phil tossed up with a sparrow for a pair of legs and an eagle for a nose, losing both times, but was like a vulture in the tackle! A player had also replaced Joey Jones as equally unblessed in the marbles department. "Barney Rubble" by nickname and "Barney Rubble" by nature, Alan Kennedy was another of the "brick wall" school. Bob knew you didn't have to be a great player to play for the Reds. Liverpool had a great TEAM. Season '79-'80 saw Bob sign Israeli international Avi Cohen from Maccabi Tel Aviv. Avi was of the Jewish faith. It was said at first that Avi would be unable to play on a Saturday, the Jewish Sabbath. When Bob was asked how he felt about an experienced international being unable to play for Liverpool on a Saturday Bob replied, "There's a few internationals can't get a game for us on a Saturday so he won't be on his own!" The League was again won with a bit to spare. The preferred eleven of: Clemence, Neal, Alan Kennedy, Thompson, Ray Kennedy, Hansen, Dalglish, Case, Johnson, McDermott and Souness missed only 28 games between them. Bob's continuity policy was long before the days of squad rotation! Bob started to give youth it's chance in season '80-'81. Sammy Lee, who had played a handful of games over the previous three seasons, became a regular in the first team. Colin Irwin played in almost half the League matches. Kevin Sheedy played a couple of games. Howard Gayle was brought into some games with great effect, most notably the European Cup semi-final second leg away to Bayern Munich. Ronnie Whelan scored on his debut, his only appearance that season, against Stoke. Oh yes, I nearly forgot, a young lad was signed from Chester for £300,000: Ian Rush. Rushie's debut was at Ipswich wearing the number 7 shirt vacated by the injured Kenny. When David Johnson was injured early in the game the bizarre front pairing was Rush and Sammy Lee! Enough to strike terror in to the heart of any defence, never mind the then England centre-half pairing of Butcher and Osman, a gawky kid making his debut and a 5 foot ballboy lookalike? I think not! Great days though were ahead of Rushie. Rushie first caught the eye in the League Cup Final replay that season against West Ham at Villa Park. He didn't score but he starred and hit the crossbar in the 2-1 victory. He looked every inch an experienced centre-forward. He was giving instructions to far more experienced players. He even had the confidence to hand out a rollicking to Kenny Dalglish for a misplaced pass! On the debit side Frank McGarvey had been and gone without ever playing in the first team. Richard Money had been signed but didn't do much at all. Bob didn't always get it right! Patchy League form meant that we only finished fifth (tut tut Bob, what are you doing?). Liverpool had though reached the European Cup Final. En route we had big wins against Oulu Palloseura in which both Souness and McDermott scored hat tricks. The then pride of Scotland, Aberdeen, were next but were beaten at their own Pittodrie by another Goal of the Season from Terry Mac. The much-fancied CSKA Sofia tried their luck but were comprehensively thrashed 5-1 at Anfield with Souness scoring a hat trick in his best ever display for Liverpool. The Bulgarians were simply ripped apart by our aggression and passion. Bob had obviously told the lads to get stuck in right from the start. One worrying moment though was when Souness and Terry Mac were caught kissing during a goal celebration! A charge of importuning in the penalty area might have been on the cards! A backs-to-the-wall display was needed at Bayern Munich after the disappointment of a goalless draw at Anfield in the first leg of the semi-final. Bayern kicked lumps out of Liverpool. An early injury casualty was Kenny Dalglish. In another of Bob's masterful tactical ploys he brought on Howard Gayle to run the Bayern defence a merry dance down the wing. The Bayern defenders were so obsessed with kicking Howard, which was the only way they could think of to stop him, they were leaving gaps in the middle. Johnson set up Ray Kennedy (two more of the walking wounded) for the decisive goal. Bob then replaced Gayle with Case. Howard had done his job! So to the final in Paris. A pretty dire game was settled by a screamer from none other than "empty head" Barney Rubble. Bob's third European Cup success; the only British manager ever to have achieved this. Rumours of a scandal, leading to player unrest, rocked the club during the summer of '81. Result was that both Ray Clemence and Jimmy Case left the club. Who did Bob replace them with? Two other top-flight experienced players? Err.. no. Bruce Grobbelaar and Craig Johnston. Johnno (or Skippy because of his Aussie background) had been noted while at Middlesbrough for his tenacious play. On the other hand, little was known about Brucie other than he had fought guerrillas in the Zimbabwean army and actually killed a few. Oh yeah, and he was as mad as a hatter, which seemed to be a pre-requisite of being signed by Bob at the time. 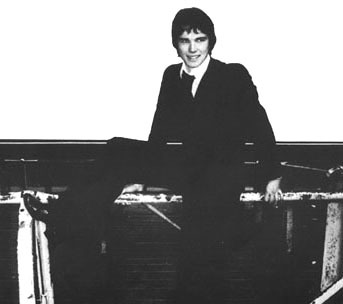 Mark Lawrenson was also signed from Brighton to form a three man defensive partnership with Thompson and Hansen: another switch in tactics, which Bob had seen was required. After a terrible start to the season, two defeats, one draw and one win, Paisley criticised his players: "They have got to be professional not playboys or fly-by-nights. I am talking about the attitude. The players seem to be saying sorry and think it's over and done with. They will have to change their attitude." Paisley also vented his frustration at the fans during that season, he didn't want Liverpool to end up fifth in the League again: "I never thought the day would come when I would have to appeal to our own fans for more support, but that is what we need right now. Too many take it for granted that we only have to turn up to win." Brucie's erratic goalkeeping was causing concern. This manifested itself to such an extent that in possibly Brucie's worst ever performance for Liverpool the Reds were humiliated 1-3 at home by Manchester City on Boxing Day. With the Reds down to eleventh place and no chance of winning the League (!) drastic action was required. What did Bob do? Replace Grobbelaar? No, Bob knew that he had a gem in Brucie, he just had to be persevered with. Bob took the unusual step of changing captains in mid-season. Okay, Thommo was upset when the leadership was taken away from him but Bob's decision to make Souness his first in command on the pitch proved to be totally justified. One of Bob's decisions at the time was to let Kevin Sheedy leave for Everton where he would be guaranteed first team football. Seriously, eyebrows were raised as to the wisdom of Bob's decision. 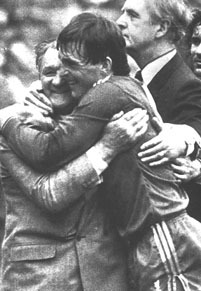 Bob though had clearly seen in Ronnie Whelan some qualities that had been lacking in Sheedy. Sheedy went on to become a great player at Everton, no doubt about that, but noone can claim Whelan didn't make a success of it at Liverpool. With Souness at the helm on the pitch and youngsters Rush and Whelan putting in stirring performances seemingly every game things soon started to turn. Brucie started to look the great goalkeeper that Bob always knew he was. The League Cup Final at Wembley against Spurs seemed to be going the way of the Londoners who led for most of the game after an early goal from Archibald. That was until three minutes from the end when Sammy Lee played a forty yard ball to Whelan that, had the media darling from Tottenham, Glenn Hoddle, played it would have had camera crews, commentators and football writers in paroxysms of delight. Ronnie smashed the ball high into the net to send the game to extra-time. Cue Bob the motivator and psychologist. Obviously all the players from both sides were very tired. Bob though told all our lads to stay on their feet during the interval between full time and the extra thirty minutes. We had the upper hand now; let's keep it that way. Don't let the Spurs players see we were tired. Meanwhile, the Tottenham players looked a spent force. Lying all over the pitch, cramped-up muscles being massaged back to life. Manager and coaching staff putting consoling arms around the players, they did indeed look a sorry lot. Our players on the other hand looked raring to go. So it proved as another goal from Ronnie Whelan and one from Rushie confirmed our second successive League Cup success. Bob had pulled off a psychological stroke that Shanks himself would have been proud of. The last 25 League games of the season saw just two defeats and three draws. Bob's fifth League Championship was confirmed with a game to spare as Tottenham were defeated 3-1 at Anfield. Dalglish voted best player of the year, Rush best young player and Paisley manager of the year for the 1982-1983 season, a fitting end to Bob's managerial reign. Bob announced at the start of the 1982-83 season that he was to retire at the end of the season. He had done virtually everything he could as manager and wanted to take a well-earned retirement. Could he go out on a winning note? You bet he could! Bob made two signings before the start of the season. To be honest, the signing of David Hodgson from Middlesbrough was fairly baffling. This move never really worked out for either player or club. On the other hand, Steve Nicol (he of the size 14 boots) was signed from Ayr United. Although Steve played only a handful of games under Bob, the great man had seen enough potential to realise that here was a star for the future. Bob, as usual wasn't wrong; Steve went on to become a Liverpool legend. Phil Thompson's persistent injury problems were to see him gradually phased out as Bob opted to return to a two man centre-half defensive strategy. Bob's assault on a third successive League Cup, a feat no other club, never mind manager had achieved in the competition's history, culminated in the Final at Wembley against Manchester United. With fifteen minutes to go and United leading by an early Whiteside goal Bob used his secret weapon. Send Barney Rubble up! Barney duly obliged with an equalising rocket. The game was won by a Ronnie Whelan special eight minutes into extra time. Souness, as captain, graciously allowed Bob to climb Wembley's thirty-nine steps ahead of him to lift the cup. Bob later described it as the proudest moment of his life. Well done to Souness for allowing this but even more well done to Bob for having the foresight, fifteen months earlier, of appointing this leader of men as the captain of his team. In spite of picking up only two points from the last seven matches we were so far ahead of everybody else that Bob's sixth League Championship was secured well before the end of April. In a 44 year association with Liverpool Football Club Bob Paisley saw and done it all. Player, physio, trainer, coach, counsellor, motivator, loyalist, psychologist, disciplinarian, tactician but above all else, with six League Championships, three League Cups, one UEFA Cup and three European Cups, Bob was, quite simply, the most successful manager ever in the history of British football.